GMS-1000 is one point digital controller which can be connected to only one(1) gas detector. 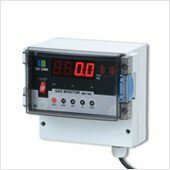 Receiving analogue continuous signal from one (1) detector and converting it into digital signal, GMS-1000 provides various alarming and monitoring environment by micro-processor. Also, GMS-1000 converts digital signal into the 4-20㎃ standard current signal for output signal which can be transmitted to various external devices such as PLC, DDC, RECODER, and so on. Using these functions, you can easily construct the gas monitoring system more extensive as well as more comprehensive. Built-in microprocessor can provide various and accurate functions. Built-in HD(high dissolution) A/D converter accurately transmits the signal. Compact & simple design enables easy installation. High/Low two step alarming contact realizes interlocking of various external devices such as fan and so on. 4 - 20㎃ output signal enables long distance(2.5km) signal transmission. Programmable menu enables user’s own environment set.